On the field alone, Avril was one of the top five pass rushers in team history. 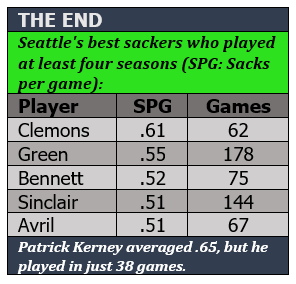 He tied for fourth in sacks per game among guys who played at least four years for Seattle (the minimum time for us to consider anyone a noteworthy Seahawk). Only Chris Clemons, Ring of Honor star Jacob Green (the career sack leader and really best DE in team history) and Michael Bennett ranked better at sacking the QB than Avril. “Cliff was a fantastic player for us,” Carroll said. “We were very fortunate to get him back when we did years ago. And because of where he had been and what he had been through, he came in with a chip on his shoulder and something to prove, and did nothing but great stuff. He also thanked the franchise, his teammates and the fans. Previous PostHow the Hawks moved down to add GreenNext PostHawks will pay Wilson $30M APY in 2020, but in what form?